Imagine this gorgeous salad as part of a beautiful Christmas banquet. Adding so much colour, and fresh and light crunch this salad is one that pleases the eye and the palette! I’ve been getting such a gorgeous steady supply of these beautiful golden yellow coloured beetroots and I really love them! I love them because they are different, but they also have a slightly more subtle light flavour so they are perfect for a salad like this! For this salad, I haven’t peeled the beets, as they washed up really nicely, but you could do that if you preferred. If you haven’t got roasted hazelnuts in the pantry just roast them for 10 minutes at 180ºC, or until golden in colour. The skins should begin to just fall on when rubbed gently. There are a number of different ways to extract pomegranate seeds. I like to slice the top off, slice down the ridges, give a good tap and break the segments apart, letting all the seeds just pop out. Perhaps I should do a video on it sometime! The balsamic reduction is really straightforward to make in the Thermomix. Super easy! You just combine 500g balsamic & 50g honey into the Thermomix and cook 25-30 Mins/Varoma/Speed 3, with the simmering basket on top. A delicious, punchy, fresh & crisp salad adaptable to any banquet celebration or for a quick lunch with friends! Place the pickling ingredients into the thermomix and heat 10 Mins/100º/Speed 1. Finely slice the fennel on a mandolin and place into a small bowl. Finely slice the golden beetroot on a mandolin and place into another small bowl. Pour the pickling liquid over the fennel to cover and leave for 10 minutes. Strain the pickling liquid over the beetroot to cover and leave that to pickle for 10 minutes. Once the fennel and beetroot is pickled, set them aside for plating. Place the watercress on a large platter and arrange slices of the pickled beetroot nicely around the plate. Place handfuls of the pickled fennel around the platter. Sprinkle with the pomegranate seeds & roasted hazelnuts. Drizzle with a little olive oil and sprinkle with black salt. Top the salad with some delicate sprigs of the micro herbs and drizzle with the balsamic reduction. This entry was posted in Ketogenic, Lunchbox, Paleo, Salads, Vegan and tagged Salad. This salad is delightfully fresh, zesty and punchy! The fresh herbs really make it! My sister-in-law and I always used to make this salad with cous cous. It’s merged over the years to have quinoa instead as its a healthier option & of course gluten free. It’s delicious with the cous cous, however I think it’s better with quinoa! I love quinoa, it’s little nutty tasting, soft textured balls make for a delicious bowl of goodness! I sear the chicken in a pan and then if necessary finish in the oven. It gives the breast some nice caramelisation which I really love! You can do this too, or if you like the chicken steamed you can steam it on the Varoma tray 17-20 Mins/Varoma/Speed 2, whilst you are cooking the quinoa. Or if you have 500g pre-cooked and shredded chicken you can toss that into the salad! The fresh herbs are integral to this awesome salad! They add the flavour and freshness. 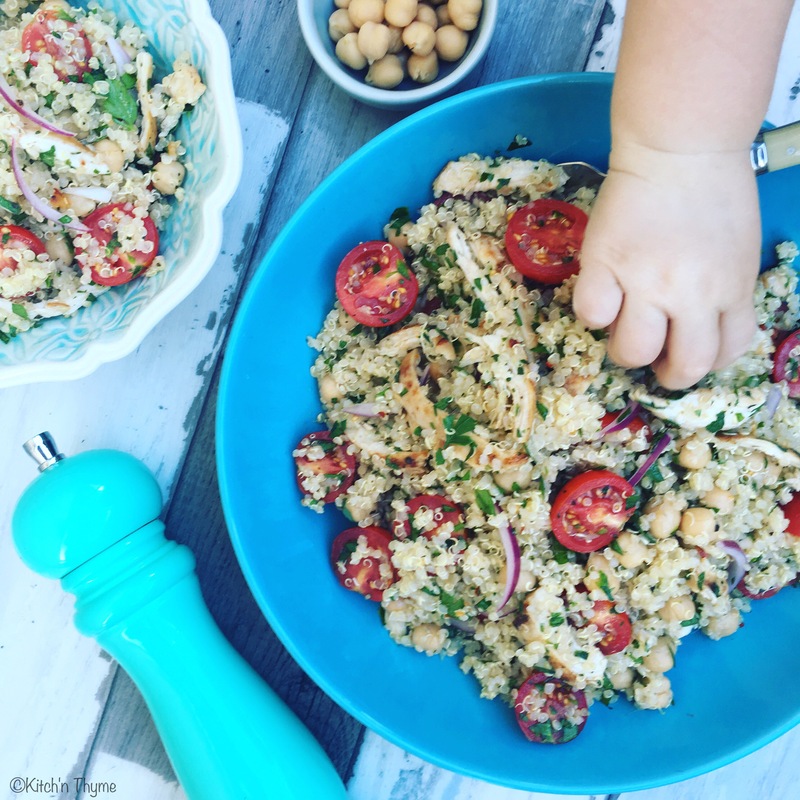 My kids love this salad, especially my little 17 month old! As you can see by the picture she really loves to eat it right when mummy wants to take photos! Of course…it’s much too yummy to be looked at, it is to be eaten after all! This delicious fresh flavour-packed simple salad makes the perfect addition to any bbq, celebration or simply for weekday lunches or kids lunchboxes! 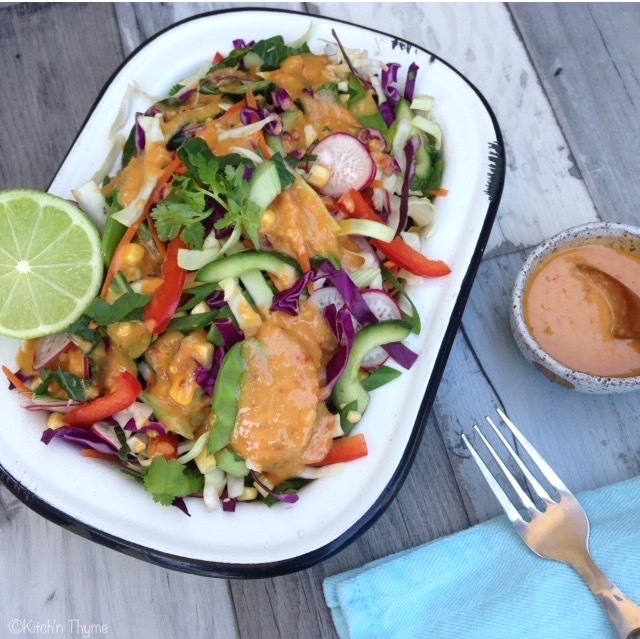 Reader Heidi says: "This is a flavoursome simple recipe which is divine on your taste buds!." Soak the quinoa 30 minutes prior to cooking this recipe. Once the chicken is cooked and cooled sightly, shred the chicken into pieces by hand or place into the Thermomix and shred 3-4 Sec/Speed 4-5/Reverse (keeping a close eye on it that it doesn't turn into paste!) Set aside. Place the soaked quinoa into the simmering basket. Place the water into the mixing bowl and insert the basket. Cook for 20-25 Mins/Varoma/Speed 2. Remove the simmering basket and set aside to drain. Place the quinoa into a large mixing bowl to cool down. Once cooled, add the chicken along with all the remaining ingredients. Place the dressing ingredients into the Thermomix and mix 3 Sec/Speed 5. Pour over the salad just prior to serving and toss to combine! Yum! *When cooking the chicken breast, if you have really thick breasts you can slice them horizontally to make them a little thinner so that the meat will cook more evenly. * This makes an awesome salad in a jar too! Place the dressing on the base of the jar, followed by the chicken, quinoa, tomatoes, onion, and herbs on top! This entry was posted in Entrees, Kids Parties, Lunchbox, Mains, Salads and tagged Chicken, Chickpeas, Quinoa, Salad. Let me just paint a picture for a moment of life as a mummy blogger!!…. You have a toilet training toddler and a newly walking baby that are both into everything!! !…albeit, cute and as adorable as anything!…Well, after 3 hours of working on the same thing, you finally get to finish it and EAT!….If any of you out there relate, this salad is worth waiting for! The weather is heating up and this salad makes the perfect addition to a lunchbox with some boiled eggs, to a BBQ, a picnic or to dinner! Beautiful with Roast Lamb or Grilled Chicken, I’m sure you will enjoy it! I use my delicious Hazelnut & Macadamia Dukkah. I love how easy it is to make in my Thermomix, including dry roasting the spices first in the same machine! So handy! Quinoa is such a nutritious pseudo-grain! It’s high protein content makes it a really healthy option for kids and adults alike. Its yummy nutty flavour, really makes it so suitable for fresh salads, especially this dukkah spiced one! The salad ingredients are honestly quite flexible. If you don’t have cucumber, try snowpeas. If you don’t have pumpkin, both carrot or sweet potato will be nice. Radishes would also go beautifully! To make it completely Dairy Free, use Coconut Yoghurt in the dressing instead of Greek yoghurt. I’m sure many of you are beginning to pencil ideas for outdoor and festive season entertaining, so add this one to list, it won’t disappoint! 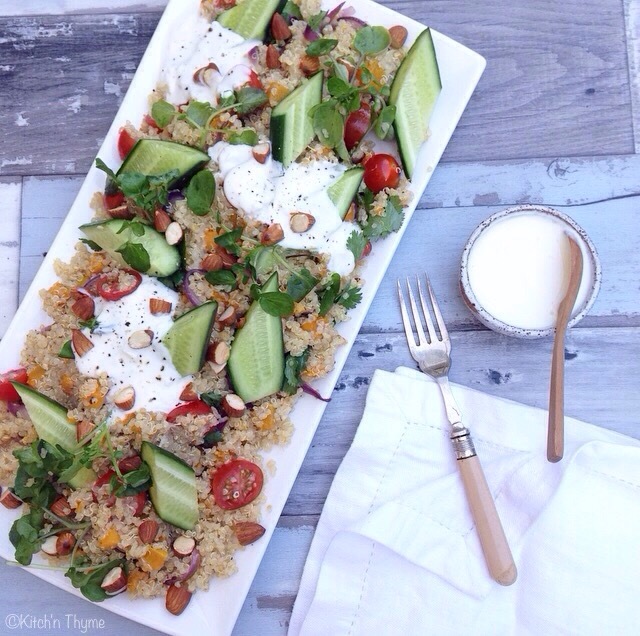 Beautiful middle eastern flavours combined to make one yummy salad! 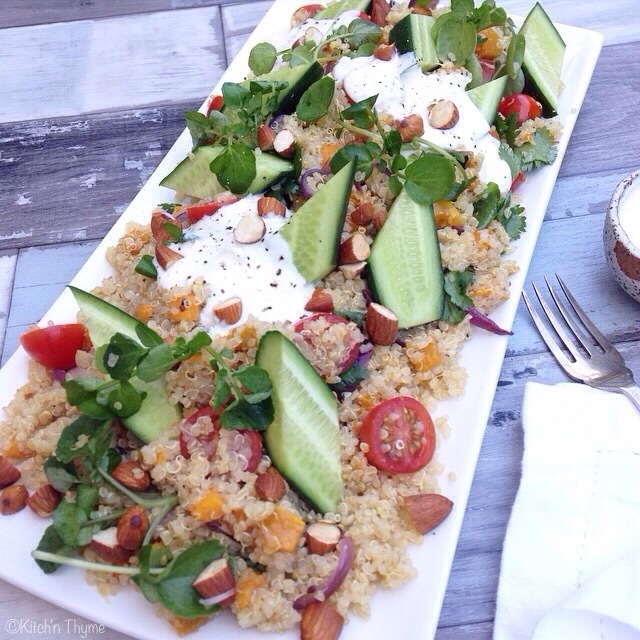 Make my delicious Hazelnut & Macadamia Dukkah for this salad! Place the soaked quinoa into the simmering basket. Place the water into the mixing bowl and insert the basket. Cook for 20-25 Mins/Varoma/Speed 2. Remove the simmering basket and set aside to drain. Place the quinoa into a large mixing bowl. Line a medium baking tray with baking paper. Preheat the oven to 180°C. Place the pumpkin on the tray and add the dukkah and 1 Tbsp of the olive oil. Toss with your hands to coat the pumpkin thoroughly. Place into the oven to roast for 15 minutes or until just tender with a knife. Place into the mixing bowl with the quinoa. Heat the remaining 2 Tbsp oil in a medium frypan over medium heat. Cook the onion & garlic, stirring for 3 minutes. Add to the large mixing bowl. Add the tomatoes, cucumbers, watercress & coriander. Add the olive oil, salt and lemon and toss well to combine all the ingredients. For the yoghurt dressing, place the garlic into the Thermomix and chop 3 Sec/Speed 7. Scrape down the sides, add the yoghurt and salt and mix 5 Sec/Speed 3. 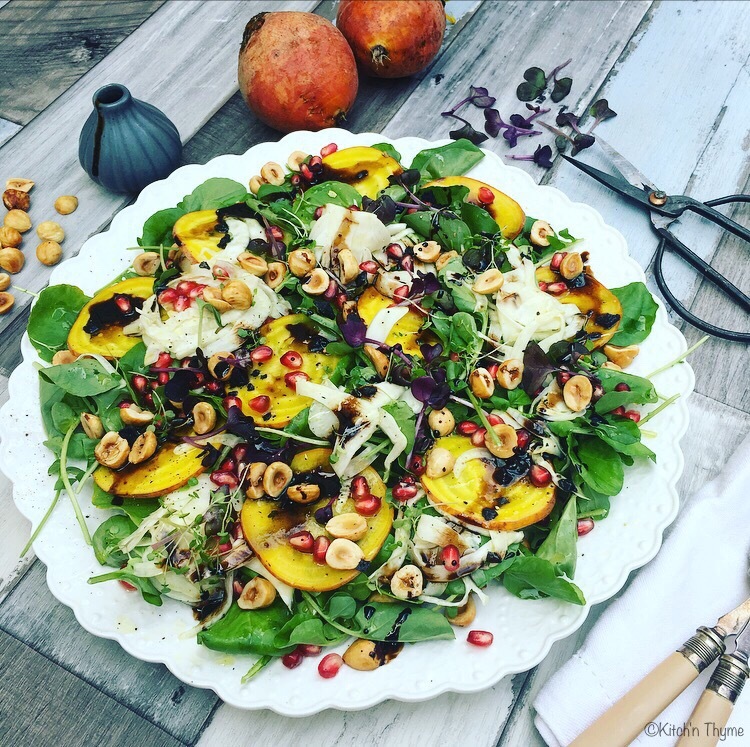 Serve the salad on a large platter, topped with the roasted almonds, the yoghurt dressing, extra dukkah if you desire and a generous grind of black pepper. 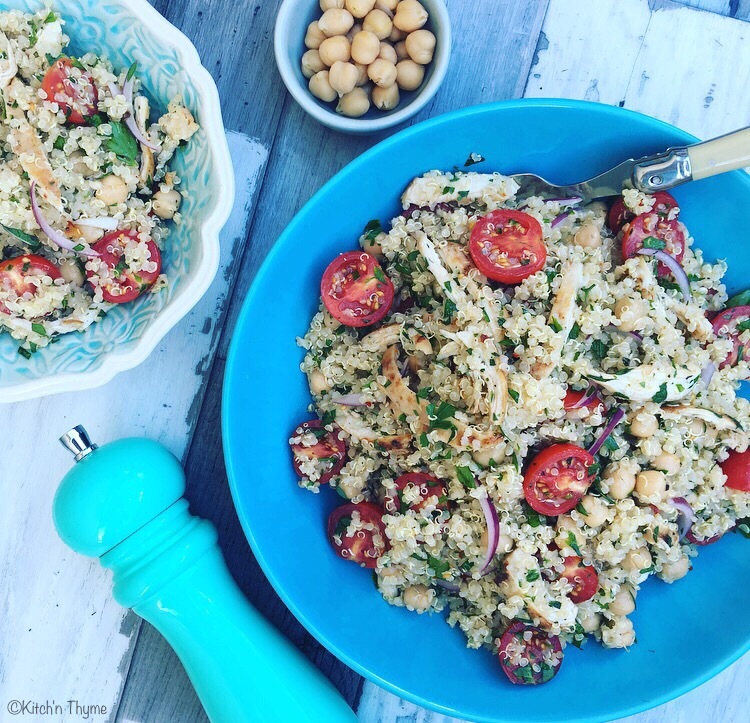 You'll need to make a batch of my delicious Hazelnut & Macadamia Dukkah for this recipe! This entry was posted in Lunchbox, Mains, Salads and tagged Dairy Free, Gluten Free, Quinoa, Roast Pumpkin, Salad. This is absolutely perfect coming into summer! 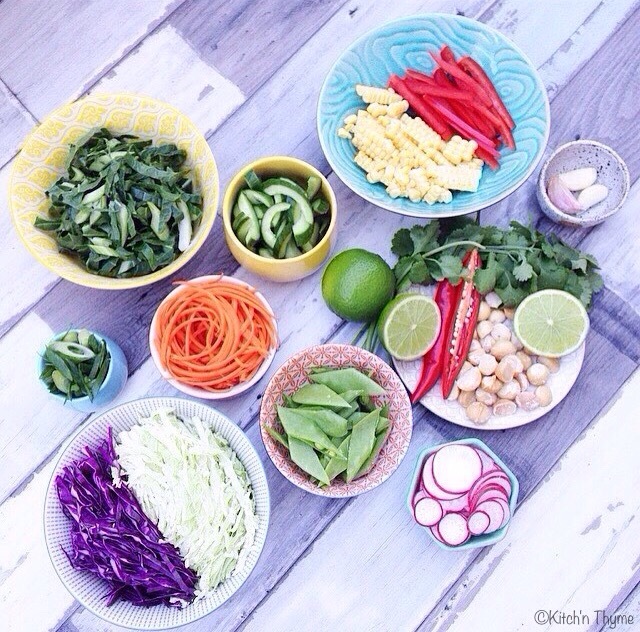 Fresh, crispy, crunchy, colourful, quick and yummy! You can’t really beat that! Well you can until this dressing is drizzled over the top! Packed with flavour, it’s one of the quickest, yummiest, creamiest dressings to make! We love salads in our house! Salads all year around! I pack my husband up with salad everyday for work, its the perfect meal of the day to eat salad! My toddler also loves salad too, and I love that! Salads are such a great way of getting fresh raw nutrition into you! However, salads on their own are pretty boring without dressing! So a good dressing is key! Whether you go creamy or a classic style vinaigrette, you will be amazed at how much more appealing that bowl of rabbit food can become! I have lots of salads and dressings to put up on the blog, and I’m realising I must have a real love for creamy dressings, because so many of them are creamy! Of course too I love a beautiful classic olive oil, lemon and salt, which just about goes with any salad!….That’s always there as the backup plan! 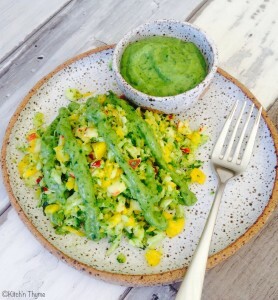 You could increase the chilli content (or just keep the membrane and seeds in) of this dressing if you want that real kick, however I make it quite mild to suit the little people palettes in my house! 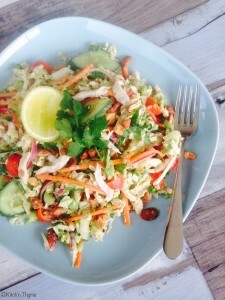 A super crispy crunchy Asian Salad with the yummiest dressing! Perfect topped with grilled meats, tofu or just some boiled eggs! Preheat the oven to 180°C. Place the macadamias onto a baking tray lined with baking paper and roast until golden brown. Place a small jug onto the Thermomix lid and weigh 100ml oil into the jug. Set aside. Place the nuts, chilli, ginger & garlic into the Thermomix and chop 3 Sec/Speed 7. Add the honey, vinegar, tamari, lime juice and salt and process 1 Min/Speed 3. Whilst the Thermomix is running, slowly pour the reserved olive oil onto the lid, letting it drizzle into mixing bowl to emulsify. Set aside. Place all the salad ingredients into a large bowl and toss well to combine. Pour the dressing over the salad just before serving, to avoid making the salad soggy. You can use a variety of whichever crispy salad vegetables you have in your fridge, so don't be too particular about getting exactly what my recipe says. 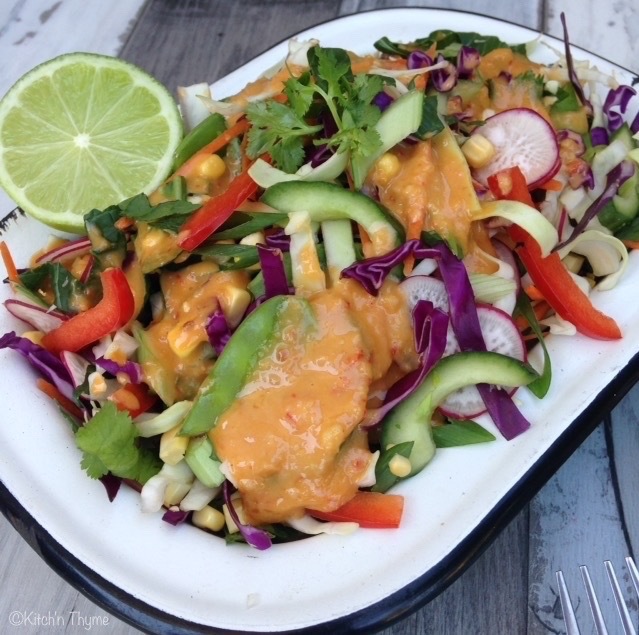 This entry was posted in Entrees, Ketogenic, Paleo, Salads and tagged Asian, Macadamia, Salad. I’ve been wanting to get this salad up on the blog for many months! Now before I go any further I just need to enlighten you on the reality of running a blog with 2 small children! Of course the day I do decide to try and photograph the salad is the day one of my babies won’t sleep in her bed – only on mum! So she’s on my back in the Ergo carrier so she won’t attack the photo set and she promptly goes to sleep! I line everything up, ready to snap away! I go to take the photo and my storage is full! Ok, so I spend 5 minutes making some storage space on my iPhone….yes I do take all of my photos on an iPhone!…So now we are all ready to go again! My saving grace was the rest of the salad in the kitchen! I could replate and have another go! So by the end of the day I finally had a photo! Some days it’s easy to lose focus on what this is all about! My aim is to share the things I’m doing to nourish my family…and that was today! This is another recipe from a number of years ago. I used to serve this somewhat regularly at the health retreat as a perfect lunch option. And it makes the perfect option for me and obviously my 2 year old at home too! Good protein, good carbs and good fats from the dressing too! Over time, I’ve done a couple of different dressings. I couldn’t work out which one to share, so I’ve gone with the Creamy Coconut Dressing. I’m happy to share the other one which is a more traditional tamari sesame dressing! Both delicious! I often make this salad and serve it with my yummy Sticky Sesame Chicken for a delicious dinner! A perfect one bowl meal for a light lunch or dinner. Place the water and coconut cream into the Thermomix bowl and insert the simmering basket. Place the chicken, chilli, lemongrass, coriander, lime leaves and salt into the basket. Cook the chicken 20 Mins/100°/Speed 3. Remove the basket with the spatula and set the chicken aside for 5 mins to cool slightly. Discard the aromatics in the basket and the cooking water. Tear the chicken into a few chunks and place back into the Thermomix bowl. Shred the chicken 5 Sec/Reverse/Speed 4. Place into a large mixing bowl. Place all the salad veges and the nuts into the large mixing bowl with the chicken and toss to combine. For the dressing, place all the ingredients into the Thermomix bowl and blend 30 Sec/Speed 8. Drizzle over the salad and toss to combine if serving straight away or serve on the side so the salad doesn't get soggy. *You can cook the chicken in all water to save on coconut cream if desired. This entry was posted in Entrees, Ketogenic, Lunchbox, Mains, Paleo, Salads and tagged Chicken, Salad. At the recent Thermomix Spectacular on the Sunshine Coast, I teamed up with my beautiful friend from over at Desperate Healthwives. We had a gorgeous simple Raw/Paleo, Nut Butter/Nut Milk stand. Along with that gorgeous Raw Macadamia Salted Caramel that I know many of you wanted to lick the plate off, we did this gorgeous fresh salad! It’s a bit of a take on the classic Thermomix Beetroot Salad. We’ve jazzed it up with gorgeous Golden Beetroots that are in season at the moment mixed with fresh spray free broccoli and of course this to die for Green Goddess Dressing! The original credit for the dressing goes to Oh She Glows. If you google green goddess dressing you can read about the history of this awesome dressing too! I’ve converted it to a recipe for the Thermomix and we have added in some fresh Coriander along with the other herbs! I use honey for a touch of sweetener, obviously if you’re vegan you can substitute with some maple syrup. It is 100% lick the bowl material!! Drizzled over this salad it’s a perfect match made in heaven! I know it sort of looks a bit like green slop on a plate, but when you taste it, you completely forget that you are eating green sludge!….Saying that, just look how vibrant green it is! Really you can’t get more ‘real’ food than that! The avocado makes it oh so creamy & smooth, yet it’s still so light….and you almost want to drink it! Enjoy! 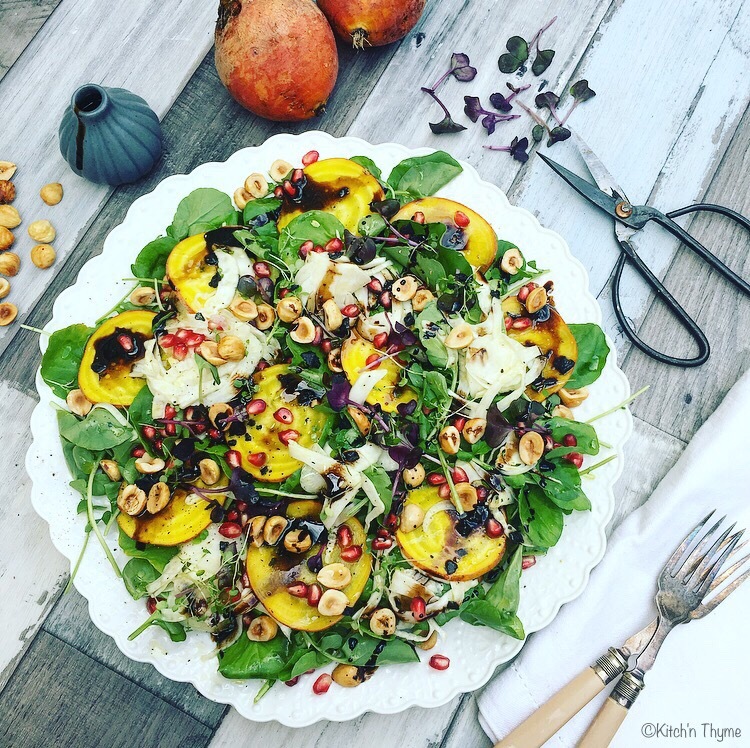 This gorgeous salad is oh so refreshing and nourishing! Place all ingredients into mixing bowl and chop 3-5 Sec/Speed 4. Scrape down the sides of the bowl and chop a further 1-2 Sec/Speed 4, or until desired consistency is achieved. Be careful not to over process or it will turn into a dip - delightful as that may be!! Serve straight away with the dressing or cover and place in the fridge until serving. Place the garlic into the mixing bowl and chop 3 Sec/Speed 7. Scrape down the sides of the bowl. Add the remaining ingredients and process 10-15 Sec/Speed 7. If some of the dressing is left unprocessed on the sides of the bowl just scrape down the sides and process a further 3 Sec/Speed 7. Drizzle over the salad and serve extra on the side! You will be licking the plate!! Store in an airtight container in the fridge. Will keep for about 5 days. You can add more water, vinegar, or lemon depending on how runny you would like it and your personal tastebuds. This entry was posted in Entrees, Ketogenic, Lunchbox, Paleo, Salads, Vegetable Sides and tagged Paleo, Raw, Salad, Vegan.